The memory chip market looks murky, and a rumored buyout fell through. Is this the right time to panic over Micron's future, or to pick up shares with both hands? 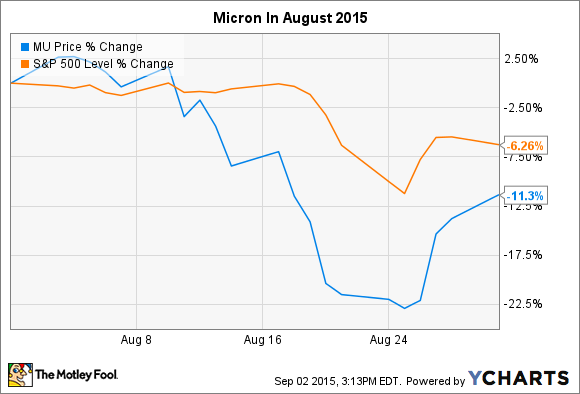 What: Shares of Micron Technology (NASDAQ:MU) fell 11.3% in August, according to data from S&P Capital IQ. The memory-chip manufacturer saw a quick 12% decline near the middle of the month, when analysts posted several negative notes on the health of the chip market in general -- and on Micron's position in it, in particular. So what: The memory market has always been cutthroat, and 2015 is no exception to that rule. Market watchers are reporting abundant supply and limited demand for these chips, cutting directly into Micron's revenue streams and profitability. Moreover, earlier rumors of a Micron buyout led by Chinese technology giant Tsinghua Unigroup have reportedly led nowhere, removing another potential value driver from the company's mix. Now what: All told, Micron shares have fallen more than 50% year to date, and the stock trades at just 5.4 times trailing earnings. In my view, the memory market has matured a great deal in the last three years, and the long-term pricing picture is unlikely to match the latest doomsday scenarios. With only three serious players on the field, production cycles and pricing levels are sure to stabilize in the long run. Then there's the demand side of that old supply-and-demand equation. Even if the PC industry dies a horrible death -- and I think that's a premature conclusion to begin with -- Micron still serves healthy growth markets such as mobile devices, the automotive sector, and the Internet of Things. Yes, there are significant risks in this industry. But at current prices, it's fair to say that Micron shares have already priced in some of the worst possible downside developments. It wouldn't take much of a positive surprise to duplicate the rocket ride Micron saw in 2013, when its share price more than tripled. Against this backdrop, I'd call Micron one of the most attractive buying opportunities on the market today -- even without a pending Chinese buyout.